Shoq’s Dad Was A Filthy Liberal: Oh, And A War Hero, Too! …just to check in on her, as I try to do regularly, even if I don't need the free lunch. When I arrived, she was scanning pages of my Dad's war diary, a classic piece of memorabilia chronicling his 25 missions over Germany in a B-17 "Flying Fortress," while serving in the Eighth Air Force's 96th Bomb Group in England from 1943 to 1944. Noticing something odd, I snatched the paperback-sized tome from her, and was shocked to find a newspaper photograph stuck to an inside cover page, from whence it must have come unstuck after some 65 years of being hidden there between that page and the book's inside cover. This incredible artifact, shown below, witnessed my dad being medaled with the Distinguished Flying Cross, one of our nation's highest military honors. Medaled with him, are the three other surviving crewmen from what was surely deserving of the title, "a mission from hell." The six other crewmen aboard that ill-fated flight were all killed. Returning over the English channel, after one of the largest daylight bombing raids of the war, their aircraft sustained heavy anti-aircraft flak damage, and punishing incoming cannon and machine gun rounds from two different flights of German fighters. The pilot, a friend of my Dad's since flight school, took an exploding flak shell right in his torso and died instantly. His entrails rained down on the navigator's station directly below his chair—where my father sat. Trained as a pilot, Dad was summoned to what remained of the cockpit by Fred, the co-pilot, himself badly wounded and unable to fly. Dad moved Fred below, and took control of the aircraft, and got it back on course, heading across the Channel to the English coast, but only after the crew had taken their typical "Do We Desert and Head for Sweden and Sit Out the War" vote. (Despite all the nonsensical movie portrayals of the imagined heroics of that time, this vote was a regular event aboard many Allied aircraft throughout the war). The plane limped across the water at an altitude of only 250 feet. With two flaps shredded, and an unresponsive rudder, Dad was pretty sure the plane wouldn't make landfall. But ditching in the water would mean almost certain death for two crewman who were still alive (at that time), so he pushed on, desperately scanning the air charts for an emergency landing field. He found one on the charts, but as he approached it, there were no runway lights on. Confused, he radioed the field, and a young British officer told him that the field was closed for some reason that she would not elaborate about, but he was ordered to either find another field, or ditch the aircraft. He radioed back, "Well, young lady, you might want to open it again, because I'm about to land there, and having your permission isn't the first thing on my mind right now." So land he did. And both he and his crew were immediately arrested and detained for about 12 hours. It was quite remarkable why the field was closed, and due to something widely documented, and which had a dramatic impact on the British people, as well as my father's life. I can't tell you what that is, however, because the event is traceable, and it would reveal my Dad's identity, and thus, that of your's truly, as well. 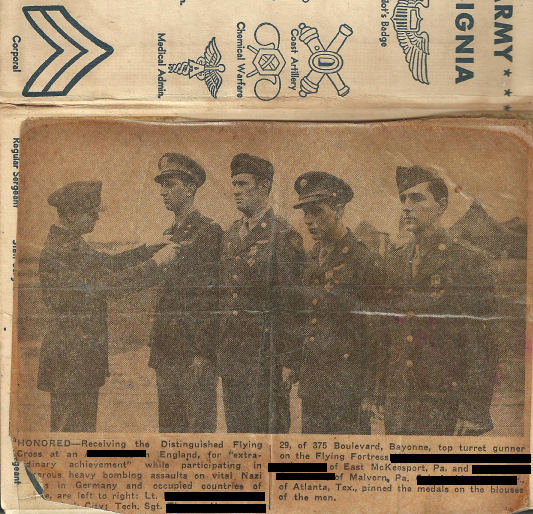 All I can say is that this medal ceremony was witnessed by a major figure in the war, who personally commended Dad not only for his flying skills, but also his judgment in disobeying a direct order in order to save what remained of his crew. My father was about as liberal as an economist who believed in capitalism could be. And it skeeves me to this day, when some moronic conservative berates me or some other liberal as being somehow unpatriotic, disloyal, or cowardly in the face of imminent danger to their country or themselves. Few of those blowhards ever faced a real threat, as my father had, except perhaps in their fantasies. And I have little doubt that if they had, even fewer of them would perform as well as he did—or as valiantly. In my view, our nation is now under a greater attack than anything the Nazis or Japanese ever threw at us. The ruthless greed and unthinking recklessness of the super elites and their conservative tools must be stopped, or future generations will never know of the liberal luxuries which my father's generation, through their service and their bravery, helped me and my contemporaries to enjoy. I almost forgot the best part of this story. For years, I thought I had lost my Dad's medals. I only learned years later from my older brother, that in fact, he had sent all of them, including the Distinguished Flying Cross, to President Nixon, as an act of protest, after learning of his secret invasion of Cambodia. My older brother has added yet a new detail I was unaware of until now. My father's takeaway from his WWII experience was that war, for almost any reason, is insane, and something to be avoided at all costs. His contempt for the Vietnam War was not at all in step with his own generation, and the thought of my brother being drafted was so loathsome to him that he had quietly considered weatherizing our family's Canadian cottage to give my brother sanctuary there, should it come to that. Fortunately, it did not. Posted in Achievements, Liberalism, Nazism, Shoq's dad.